Giveaway: A $40 dollar credit to the Gussy Shop. I happened across Maggie Whitley of Gussy Sews on Twitter, and I have been a follower ever since. She is lovely, and so are the beautiful things she sews. Everything is unique and carries her famous ruffle. I am particularly fond of this custom order she recently finished. Be sure you check out all of her creations. CJane will receive a special piece Gussy is making just for her. Can't wait to find out what it is. 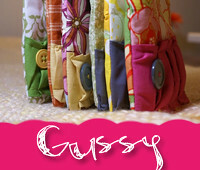 Check out Gussy Sews and come back and Leave a comment on this post telling me what your favorite Gussy Sews item is. Who needs a "Gussy for Work" for their new iPad? A winner will be chosen at random. Comments will close at midnight onWednesday April 7. The damask laptop bags are so cute! I love the damask laptop bags too, with the red! So cute! Black Damask laptop bag would be perfect for me to taking my laptop to work! I actually loving the grass green blanket! I am drooling over the lovely lattice laptop bags. The trouble would come in deciding between orange and mustard. I have a FV button on my blog. Love the hello roses checkbook cover. I just started a new job and I can see myself heading to work in such style with the #39 laptop bag in hand! I love the laptop bags and the baby blankets are so sweet! I love the Lovely Lattice laptop bags, especially the black and yellow version. Love the Gus for Work with orange! I love the black damask work bag. Love the grass green baby blanket. So bright and cheerful. I like the hot pink and damask laptop bag. Love the laptop bag #68! I like the grass green baby blanket! I love the lovely gus - hello roses gold zippered pouch! The Laptop Bag - perfect! The black damask bag with the pink! the laptop bags are perfect. just what i need. i love the black damask with yellow! I love the yellow and damask work bag! It is too cute! I heart the checkbook covers. I asked Dear FV a question. I love the large laptop bags in red/damask! I just love the check book covers! They are too cute and so much fun! I like the checkbook covers! I love the damask laptop bags, too! I LOVE the bright colors of the baby blankets. I would pick the one in fushia or grass green. I love the notecards and baby blankets! Love the grass green blanket! I like the damask laptop bags... what a fun twist on an ordinary item. I love the lattice with the yellow... so cute! I like the lovely lattice laptop bag w/ orange! so spunky! Pink/damask work bag...not that I take my laptop anywhere, but I'd find a use for it! Love the grape baby blanket! I'd love the Gus For Work - black damask laptop bag. The black damask and red laptop bag, for sure! JUST got my first laptop so I'm lovin' those! Gussy *netbook* bag! so adoarable! The baby blankets are so cute! LOVE the damask laptop bags! so cute!! I love the beautiful Yellow and Blue Baby Blanket! i love, love, love the laptop bags and the tourquoise baby blanket. I would get the Gus For Work - black damask work/laptop bag for me. Or I would get one of those cute baby blankets for my best friend who is having her first kid in a few months. My laptop needs the Gus for Work- Lovely Lattice Bag! my fav is the gussy laptop bag with the damask fabric. I like the red and black damask bag! Cute! The Gus For Work - black damask work/laptop bag in Yellow. Lovely Gus - Hello Roses, Gold zipped pouch for me! The zippered pouches are cute! I love the Ruffle Gus checkbook cover in PINK!! I love the damask laptop bags...so cute! I love the damask laptop bags. Too cute!! I like the cute checkbook covers and the blanket! I want a little Gussy wallet/clutch! I like the baby blanket in grape! I like the Green Grass baby blanket. Gus for Work- in black damask. I guess I have babies on the brain - I like that cute yellow/blue baby blanket. Baby Blanket-yellow and blue. I am starting all over with boys items! Love the fuchsia baby blanket! Baby blanket in every color especially grape--I might have a girl some day! Gus For Work - *netbook size* laptop/work bag - 39. This would make life SO much easier. the yellow and blue baby blanket. love the baby blankets and the lovely lattice laptop bag. I love the baby blankets! I like the yellow Lovely Lattice laptop bag! I MUST HAVE the grass green baby blanket. I love it (and the turquoise)! Loving the turquoise baby blanket! I love the lemon print checkbook cover and the zipped pouch. So cute!! I gotta say I love the skinny gus little zippered pouches and the note cards! I LOVE the Baby Blanket - grass green - 59!! Following Gussy on Twitter (@surromama2). Im loving the #45 laptop case! SO cute and creative! ruffles, i love ruffles! zipped pouch is my favorite! following gussy! a new fav. I love the black damask work bag! I LOVE the Gus for work Lovely Lattice bag with the orange trim. So fun! Love the Gussy for work in yellow and black. So pretty! Gus For Work - Black Damask laptop bag with the red ruffles. Too cute. Loving the checkbook covers-anything that makes paying bills a bit more fun is a must have! The gussy for netbook is exactly what I have been looking for. Love the fuchsia baby blankey! I love the notebook 'carriers'...what a clever and cute idea! I love any of the bags and the baby blankets. The grass green baby blanket! Really, really like the damask laptop bags! My lime green laptop would look so cute in one! I love the ruffled checkbook cover! I like the Gus for Work - Black Damask w/ pink ruffle. I can't decide between the black damask with red ruffle or a cute checkbook cover. okay this was hard so I'm saying a couple favs, the lemon print checkbook cover, soo cute and I just purchase that same lemon fabric to sew with! I also like the netbook bag, with the pink/green flowers and cream ruffle. Very cute stuff! I bookmarked Gussy, too cute to forget. And I'm following FV, thanks! I like the orange and black "Gus for Work" Netbook size bag - Number 51. Gus for work wide lovely lattice laptop in Green or Orange are definitely my faves. I love the netbook bag...especially the pink and turquoise! Too cute! I left you a question at Dear FV! lattice laptop bag in yellow is my favourite! the black and pink damask gus for work bag. lovin it! The fuschia baby blanket is beautiful! I know several little ones who would love it! Love the damask bag with green!! gus for work - black damask lap to bag. so fashionable! I love the black damask laptop bag! i would love the grass green baby blanket to snuggle with as i hope and hope!